Where exactly are the NX class's escape pods located? Memory alpha says E-Deck, which makes sense (and is I believe canon), and so does this fan deck plan diagram, which I believe uses canon sources to find out where everything goes. However, the one time we get to see Enterprise launch escape pods, in "In a Mirror Darkly", they appear to get launched from D-deck. How can this be remedied? The ship does not need more than about 25 lifepods, and at least 2/3 of that amount can be seen launching from D-deck in IaMD. This would be problematic, because there would be almost no space for the windows ( which I think there are some) in the walls of D-deck. 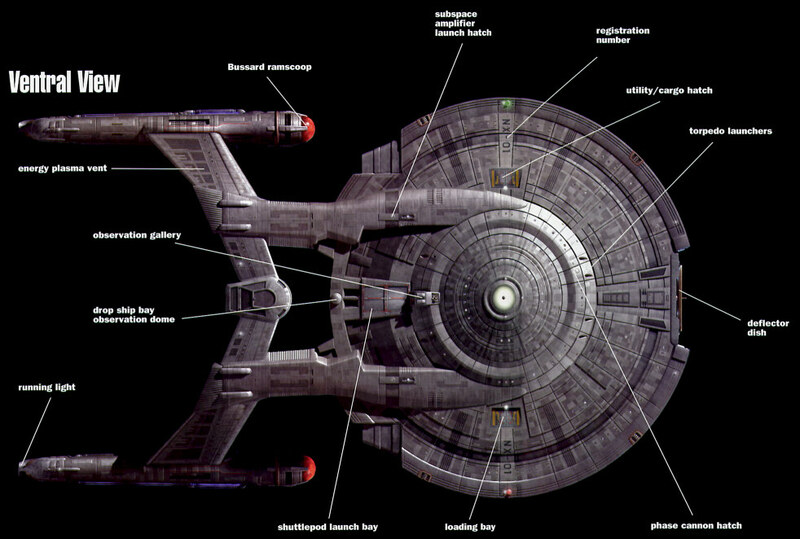 there appears to be a nice little cut-out on the bottom of the ship, on deck E( it runs through the hyphen on NX-01 on the bottom panels) where life pods could launch from, that would corespond with the fan diagram, and the canon sources that say that say that the pods are on E deck. So, how can this problem be remedied? Maybe. But if the crew were forced to evacuate, in case of a disaster or an attack, thereis a greater chance that more of the crew would survive if the pods were disabled or damaged. YOu'd only lose 4 per pod instead of 10 people. ANd if there are enough pods to go around, why not let the escapies escape in comfort. Or maybe the pod could only efficiently carry 4 people with out having to upgrade it's power capacity etc. And what happens if they lose life support on E-Deck? The whole damn ship is skrewed haha. Oh and by the way hi, nice to be here. If you haven't noticed, I'm new. So please make it gentle. To the spanking room with you! Can escape pods dock together? Because it might make sense if they did. If the ship's exploding around your ears, you'd wanna jump into the nearest one even if it was maybe getting a little overcrowded, and worry about life support limitations later. Or perhaps Starfleet just assumes that any latecomers to a pod would selflessly let it go without them, to avoid endangering those the pod CAN guarantee safety to. As if there'd be no chance that even one person would decide "Run another 50 metres through a burgeoning maelstrom to the next possibly-empty pod when we're 30 seconds from a core breach? Bugger that!" Well, TNG-era ones can supposedly dock together, but I don't seen how these ENT ones cane...or the ones from FC, for that matter. B.J.- They did mention having life pods in "SHuttle Pod 1" I think. Reed says something to the effect of " They can't just be gone, they'd have launched the life boats." Reed did indeed say something like that in Shuttlepod One (or maybe your spelling is right - I dunno). If I designed these things to dock together, I'd give them more than one docking collar myself - then you could form structures like the Suliban cell ships can, to help ensure survival. NO, you're spelling is correct, and I too havn't had a contentable sleep schedule on week nights for the last 6 months. I fall asleep at midnight+ 10 or 15, and wake up at 6. Weekends, I usually sleep 8 to 10 hours. Weird. Getting back on subject, I suppose it would make more sense to have the pods actually connect to another, share resources and the like. Maybe they hadn't thought of that as of the 22nd century. Perhaps they were just concerned about getting a irreplacable crew off of the ship as fast and safely as possible. WHo knows, maybe the pods have a little grappler installed, to link to eachother, forming a web of pods. And on a side note, I think you can adjust your time lapse to any time zone you want from your profile. I had to. I 'm running EST, and i think this server is on PST.